What a lovely selection of goodies we have for you all. Finally our long awaited BLUEBELL GRAY cushions and shopper bags have arrived. We couldn’t resist Fi Douglas’s new collection of beautiful hand painted watercolour designs on linen. Check out her range in this months ‘Elle Decoration’ and ‘Living Etc’ and you’ll understand why we were in a frenzy to get her product into R&R. Lookout for designs in Anemone, Harebell, Poppy and Red Rose. Stunning! We have been treated to the scents of Frangipani and Orange Blossom, Lilac Rose and Geranium from our new line of scented gifts from ABAHNA. We love their dedication to using only plants grown without chemicals and no nasties in their products. No wonder this brand is a firm favourite to members of the British Royal Family and Hollywood Celebrities. As well we have new cards, floral wrapping paper, spring flowers and gifts and accessories for your home and garden. Thanks to all who have attended our Spring Courses so far this year. We’ve had great time meeting you all and seeing your creations. Next up we have ‘Floral Wedding Design’, ‘Flowers with Mum’, Bee keeping with guest Sue Bird and Easter Gift Wrapping with guest Jane Means. For those who haven’t booked, we may have some spaces still available so please get in touch. For those who are joining us, it will be lovely to see some familiar faces and welcome new ones too. 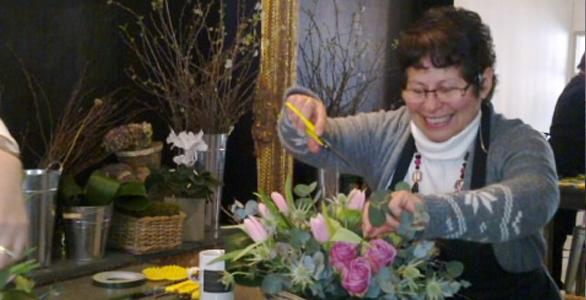 Don’t forget to check out our Spring Floristry Courses! Please contact us if you have any comments or enquiries.